Korea DPR overpowered a hapless Argentina with a record 9-0 scoreline to emphasize their title credentials at the FIFA U-20 Women’s World Cup. Korea DPR will be guaranteed progression to the knockout round with a match to spare should Norway fail to beat Canada in today's late match. The Asians were seven goals to the good by half-time, following a remarkable five goal burst after the 30-minute mark. The humid conditions in Kobe took its toll on the Argentinians who were looking ragged by part-way through the opening half, while Korea DPR were clinical in front of goal and maintained their shape for the majority of the match. 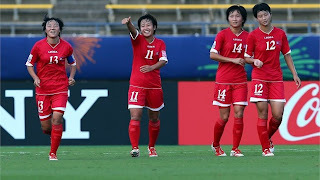 Striker Kim Un Hwa profited the most collecting a five-goal haul, to draw level with Christine Sinclair who also scored five against England in the first edition of the tournament a decade ago. The 19-year-old North Korean also moved to six goals for the tournament after scoring against Norway in the opener. However, Kim Su Gyong laid claim to the goal of the match with a rasping right-foot drive on 38 minutes. North Korea scored twice more soon after the interval but with little at stake, the 2006 champions were unable to add to their tally. The one-sided contest saw a number of records reached, with the final score edging the previous tally of 9-1 achieved by Germany against Mexico in 2006.